Engineering innovation is at an all-time high. Tech news sites spew fresh headlines about engineering feats from 3D-scanning phones to quantum computing to artificial gills. We live in a strange world where engineering breakthroughs such as these are juxtaposed against headlines about places in America where the drinking water is so poor that the water comes out of people’s taps a rusty brown color. Water treatment processes such as sand filtration and chlorination are among the most historically significant engineering feats of our time, but for some reason, this industry is being neglected. Residents in St. Joseph, La. have been dealing with the problem for years. The brown water is largely due to a deteriorating water treatment and distribution system—and although the U.S. Environmental Protection Agency (EPA) has deemed the water safe to drink, residents don’t dare touch it. St. Joseph is actually a relatively harmless case, since there have been no reports of water-related illnesses among residents. This wasn’t the case in Flint, Mich., where 8,000 children under the age of six were estimated to have been poisoned by lead and approximately 10 fatal cases of bacterial infections were linked to the poor water quality. The disaster in Flint, Mich., may be partly due to a series of engineering blunders, but it is really just one case among many. 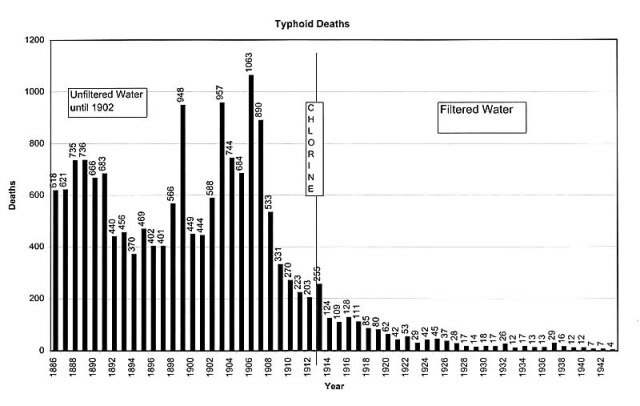 In August 2014, residents of Toledo, Ohio, were told not to drink the water because of dangerously high levels of microcystins—a toxin that can cause nausea, headaches and vomiting. That same year saw a four-day boil-water advisory in Pennsylvania that was issued to 31,000 residents across six towns. In Sebring, Ohio, routine laboratory tests in August 2015 found unsafe lead levels in the town’s water after workers stopped adding an anti-corrosive agent. A 2013 study from the EPA found that Chicago homes had lead levels exceeding the federal standard. Lead poisoning has been a problem in Washington D.C.’s tap water supply for decades. A report in 2010 from the Center for Disease Control stated that children may still be exposed to high levels of lead. This risk was heightened as a result of changing the water disinfectant chemical and only partially fixing lead pipes. Durham and Greenville, N.C., Columbia, S.C., and Jackson, Miss., have all seen incidents of lead poisoning from tap water starting in the early 2000s. How could there be so many drinking water oversights in cities across the United States? To understand the scope of the problem, let’s take a closer look. According to experts, municipalities are regularly violating water treatment regulations. A New York Times analysis of millions of federal records found that between 2004 and 2009, more than 20 percent of U.S. water treatment systems violated key provisions of the Safe Drinking Water Act. Legal action was taken on behalf of only six percent of these faulty treatment systems. The EPA issued its 2013 National Public Water Systems Compliance Report, wherein it stated that of the 149,912 active public water systems in the U.S., 40,338 had at least one significant violation during that year. 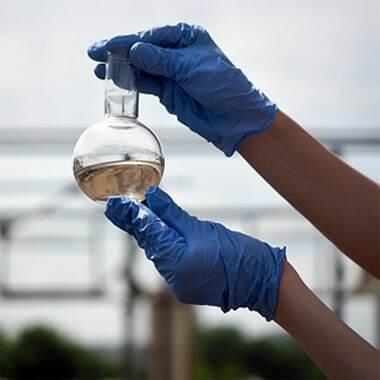 In a significant violation, an operator fails to abide by a set of regulations put in place to protect the community, such as not providing water sampling results. These violations can have lasting impacts on people’s health. For example, children under the age of six can suffer profound and permanent adverse health effects from lead poisoning — so lead testing is an essential engineering protocol. The Natural Resources Defense Council conducted an analysis of EPA data and found that more than 18 million Americans are served by 5,363 water systems that violated lead testing regulations in 2015. What Do Engineers and Water Industry Experts Think? It’s a difficult question to ask: how would you summarize the status of drinking water systems across the U.S.? 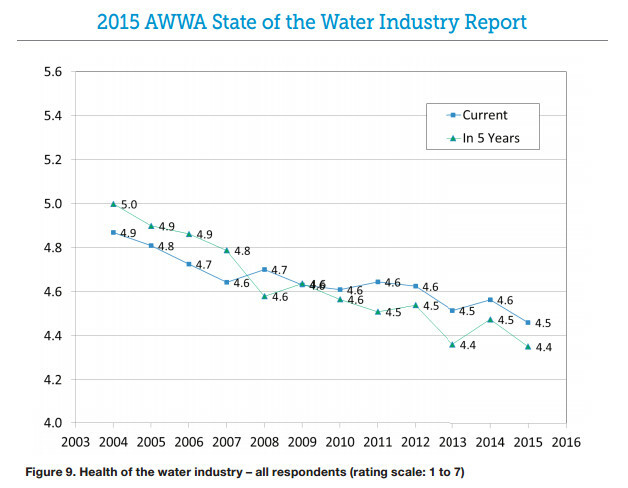 The American Water Works Association (AWWA) issues an annual State of the Water Industry Report, wherein it conducts a survey among water professionals with varying backgrounds. Among the questions in the survey was a scheme for numerically rating the overall health of the water industry. Participants in the 2015 edition of this survey rated the health of the water industry at 4.5 out of 7.0. While it is difficult to tell what exactly this means for families’ tap water, the overall trend of this survey is a little daunting, as the rating of the health of water systems has been declining for over a decade. In other terms, infrastructure in the U.S. is very old and, quite literally, crumbling. Drinking water systems are no exception. While some drinking water systems have seen modern upgrades, there is still tap water flowing from pipes that are older than our great-grandparents. Below is an illustration of the history of our drinking water systems. As it turns out, most of our water treatment and distribution systems were built in three main booms: the late 1800s, the 1920s and the post-WWII era. It is a bit chilling to discover that the average life spans of the pipes built in these eras are 120 years, 100 years, and 75 years, respectively. A few mental calculations and that brings us to the conclusion that pipe infrastructure is nearing the end of its life between 2000 and 2025. In May 2001, the AWWA published another report indicating that “water utilities must make a substantial reinvestment in infrastructure over the next 30 years.” It is now 15 years past and recent disasters such as Flint, Mich., show that those substantial reinvestments may still be pending. It is estimated that more than one million miles of water mains are in place in the United States. The conditions of many of these pipes are unknown, as they are buried underground out of sight, and owned and operated by various local entities … The Environmental Protection Agency (EPA) estimates that approximately 4,000 to 5,000 miles of drinking water mains are replaced annually. Apparently, at the current rate of water infrastructure construction it will take over 200 years to replace all of the potable water mains. And this is only the water mains, it does not even take into account pipe fixtures for individual homes and properties. Clearly, this will not get the job done. Water quality will continue to deteriorate. According to the utility company American Water, aging pipes presents two issues: contaminants can enter the pipe, or pure, treated water can seep out of the pipe, resulting in lost water. With these two types of problems at the forefront, the deterioration of America’s pipe networks is becoming more and more obvious. There are over 300,000 water main breaks in North America annually, a figure so high that water main breaks have become a regular feature in local evening news broadcasts. One would think that something as dramatic as a water main break would draw attention to the nation-wide problem. In May 2016, a water main break in Lodi, N.J., spouted water 40 ft into the air. 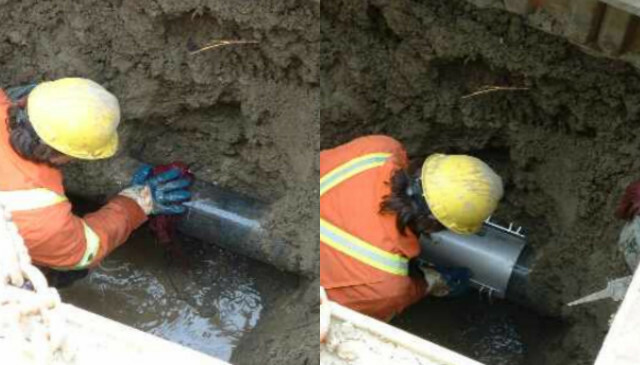 In less conspicuous news, pipe networks are extremely prone to leakage. According to the EPA, American public water systems lose one-sixth of their water supply this way. This translates to six billion gallons of water a day, or enough to supply all of New York City six times over. With California experiencing a severe drought, it’s curious that more isn’t being done to recover this huge loss. 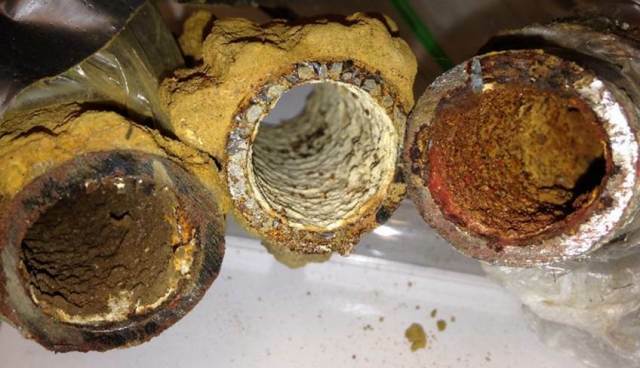 Indeed, pipe corrosion introduces a host of problems—including that it can impede water flow. This not only increases the demand for pressure, but introduces breeding grounds for bacteria. Leaky infrastructure has also impacted source protection. 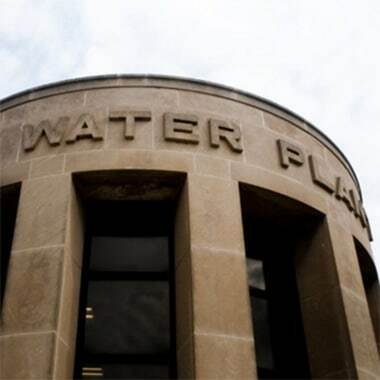 The U.S. Geological survey in Milwaukee confirmed that an outbreak in viruses in the municipal water system was likely due to a deteriorating sewer line from the 1900s that had not been properly maintained. There is another concern with old pipes: they may also have lead. Lead is a very workable metal and was incorporated into the joints of cast iron pipes from the 19th century right up until it was discontinued in the 1980s due to health concerns. Although lead water pipes were banned 30 years ago, lead is still estimated to be in 3.3 to 10 million pipe fixtures across the nation. Flint, Mich., a city established in 1855, likely contains a high level of lead in its underground pipes. When officials switched the water source to the polluted and corrosive Flint River, the lead dissolved into the tap water. Pipe corrosion is also thought to have contributed to the presence of bacteria and other contaminants in Flint residents’ tap water. Iron corrosion and rust in Flint drinking water pipes. (Image courtesy of Min Tang and Kelsey Pieper). 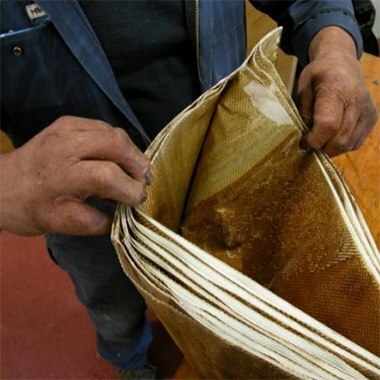 There were many precautions that could have been taken to prevent this, such as adding anti-corrosion agents. As the story details of Flint, Mich., slowly were revealed, it became increasingly clear that negligence and lack of political will were the ultimate causes of the crisis. The lack of political will is a real stickler. With over a million miles of water mains needing replacement over the next few decades, how will the U.S. pay for it? The ASCE estimates that over $1 trillion will need to be spent over the next 25 years to address the most urgent pipe replacement. As engineers, we have to ask ourselves whether there is a more economical way forward. After all, when faced with unpleasant realities, political solutions don’t always lead to a logical conclusion. For instance, when dangerously high levels of lead were found in the tap water in Washington D.C., the capital district committed to a $400-million lead pipe replacement program. This project was unfortunately abandoned after the 2008 recession and by then, only half of the pipes had been replaced. In fact, DC Water recently required that residents pay a monthly infrastructure fee. The money from these increased water rates will be invested in replacing and repairing aging pipes when they fail. Many economists are worried that municipalities will manage funds for drinking water infrastructure in this way: by making local residents foot the bill. As for economic woes, Flint, Mich., is no exception. The replacement of the city’s 15,000 lead service lines is estimated to cost $60 million and comes with a timeline of 15 years. Engineers estimate that to dig up and replace a forty-foot lead pipe will cost around $3,000 USD. This does not take into account repaving streets and sidewalks, fixing any damage done to the home, and re-sodding lawns. Funding is a problem that has not gotten any better since 2008. The EPA drinking water office is responsible for implementing drinking water standards across the nation. This sector of the EPA has experienced a 15-percent drop in budget and has lost a tenth of its staff since 2006. Funding bottlenecks occur on a state level too. In 2013, according to the Association of State Drinking Water Administrators, 17 states had cut drinking-water budgets by more than a fifth and 27 had cut spending on full-time employees. “It always comes down to funding,” said Davis Cole, senior civil engineer from H. Davis Cole & Associates. He is currently conducting work in St. Joseph, La. where the water (as shown in the beginning) comes out brown. The community needs more staff to properly maintain the water treatment plant and money to replace the deteriorating water mains. History has shown, however, that government prioritization of water and sanitation infrastructure is worth every penny. In the early 1900s, the Philadelphia Water Department surrendered the necessary expenses to filter the Schuylkill River’s Fairmount pool. That body of source water was rife was sewage, but was providing 80 percent of the city’s drinking water in the late 1800s. Illness was well known to city-dwellers. Once the river was cleaned and the water filtered, this all changed. Deaths and illnesses dropped to a fraction of what they were before. The reason this piece of history is important is because the chief engineer at the time was just like Davis Cole – tasked with improving an extremely difficult situation and frustrated that the government couldn’t invest more money to fix it. An excerpt from the water department’s annual report from 1884 expresses how he feels about the situation. Can Engineers Also Do More to Improve Water Systems? 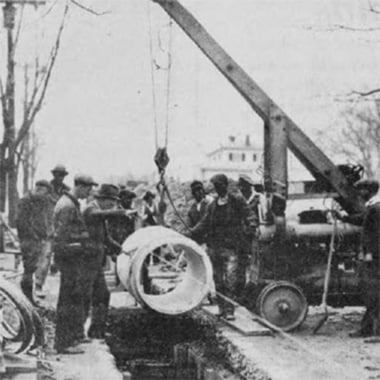 Slow sand filtration was used to clarify the water between 1901 and 1912 in Philadelphia, and the implementation of chlorine began in 1914. The engineering practice was very new, but once deployed, it transformed public health for the better – and we never went back. If the U.S. were to prioritize water treatment infrastructure and treatment technologies today, would it be possible to implement something as revolutionary as filtration and chlorination? Interestingly, drinking water systems use relatively archaic technologies compared to other U.S. infrastructure. One reason for this is that it is difficult to incorporate complex, sophisticated technology into communities that may not have access to the expertise needed to support these systems. St. Joseph, La., for example, has been in the news recently over its failing drinking water system. The rural town of 1,100 residents has been under 20 boil-water advisories since 2012. 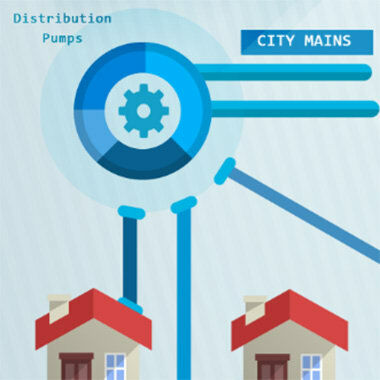 Researchers at Stanford University’s Center for Reinventing the Nation’s Urban Water Infrastructure conduct studies on how and why drinking water infrastructure is a relatively stagnant field of engineering. According to them, investment in the water industry "pales in comparison to that for renewable energy.” Out of the $4.3 billion in venture capital money that goes to the clean tech industry, only five percent of it is distributed to water technology. Their publication, The Innovation Deficit in Urban Water, states that this is because the water industry is a tightly regulated market – it’s strong focus on “public health, reliable service and compliance with regulations add up to create a system that's resistant to change." The problems in this industry are also numerous and complex, with aging pipes only being the most important one. Overhauling ancient drinking water infrastructure in a way that is safe, economic, timely and long-lasting is not simple, especially when you are faced with different problems in each municipality. Exactly how do we engage experts—and especially engineers—to become more involved in new research in this sector? That is the billion-dollar question. If that is ever to be answered, we must begin with how engineering innovation can be applied. Improving drinking water is not straightforward. There is no one place to start. There are three core components of potable water infrastructure: i) source protection, ii) treatment and iii) distribution. In order to prevent any further water treatment failures, all three components must be addressed holistically. Threats to drinking water exist on all fronts. The water system in Flint, Mich., for example, failed due to a number of errors that occurred from its source water right up to where it flowed through pipe fixtures in people’s homes. 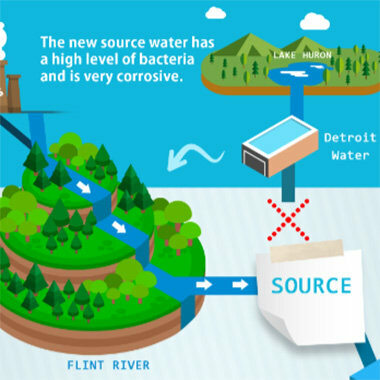 More information on what threats exist to our water systems can be found at Threats to Water from Source to Tap to How the Flint Michigan Crisis was Caused. While the scope of the problem is enormous, this also means that the opportunities are endless. With proper national prioritization, it is certainly possible for engineers, scientists and technicians to deliver much-needed solutions. Where is funding most needed in the drinking water industry? If water treatment plants are not functioning properly, should we make plans to replace them? Retrofit them? Or scrap them entirely and reorient the distribution system to take water from other plants? What does this decision depend on?